Saturday Rosemary and I went to Granville Island’s Arts Umbrella for an open house on our granddaughter Lauren’s ballet and modern dance classes. 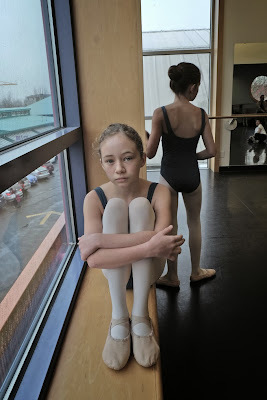 No matter how many times, through the years that I have gone to this sort of thing (we went for Rebecca’s classes until she lost interest) I always leave with the certainty that there is no better dance school in Vancouver than the Arts Umbrella Dance Program run by Artemis Gordon. 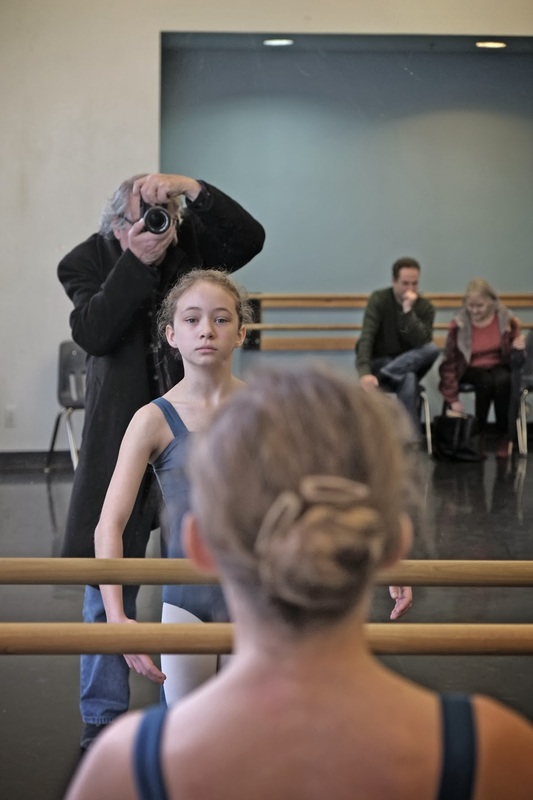 A few people understand that many of the graduates of the program have gone to some of the best ballet companies around the world, not to mention our very own Ballet BC. In fact Ballet BC has an impressively long bench of stars that I liken to a bench that runs the span from Granville and Davie (where the Vancouver Dance Centre is located) all the way to Granville Island. I particularly enjoyed today’s classes because of the program’s répétiteur, Robert, who jazzed up (most skillfully) Christmas carols or simply played beautiful jazz standards to accompany the dancers. 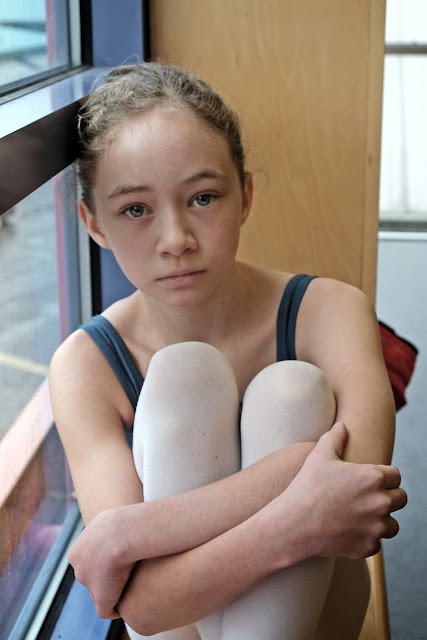 Lauren’s ballet instructor, Margaret Reader-Martin teaches with an accurate and insisting style that she softens with most personal corrections. Lauren’s modern dance teacher, London-born Claudia Segovia, gives her students lots of room to create and innovate their own ideas. I find that these two teachers become a fine balance of discipline with a let-loose policy that gives the dancers lots of confidence. Of particular note for me is the efficient performance of my very own Fuji X-E1 digital camera which seems to take lovely window portraits with a soft texture that I am warming up to. Our afternoon after the dance was an afternoon at the main branch of the Vancouver Public Library. We went home with a pile of Film DVDs and books. After a dinner of barbecued vegetables and flank steak with little potatoes baked in the oven with Parmesan cheese and olive oil we retired to the den and watched Blancanieves which is a 2012 Spanish black-and-white silent fantasy drama film written and directed by Pablo Berger. Since this circa 1920s Snow White protagonist becomes a bull fighter (of the female kind) it gave me the opportunity to explain to Lauren that bullfighting is not a sport but an art form similar to ballet. The bullfighter (who most often kills the bull and the bull most often does not reciprocate) has to be graceful in the path of danger. How he (or she) twirls the cape or the muleta (a squarish cape held in place by a sword) is poetry in motion even though Spaniards and most that are fans of the art know that the bull does not have a chance. Lauren did not question my explanation even though I suspect she might in a few years. In Mexico City as a teenager and a young man I often went to the bullfights and saw some of the best. I have no idea how I would react to one now. The film was enjoyable. I took a happy mother and daughter home (the other daughter now works on Saturday evenings). Looking back at the day I can consider it a success. But I will have to come up with a very good encore for next Saturday’s after dinner film.